With two versatile set-up options to choose from, the GearDryer Wall Mount / Rolling 12 Port boot and glove drying system is the perfect addition to your workshop, ski home, or garage. 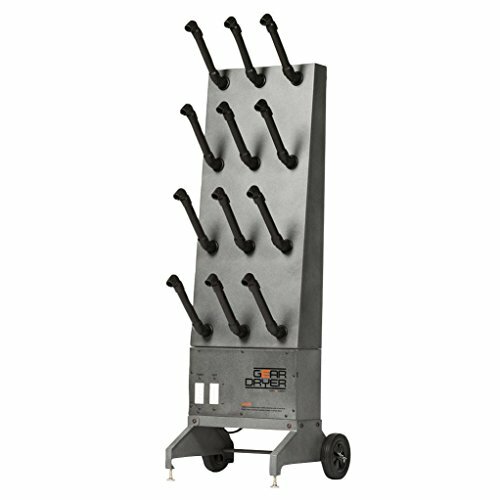 The GearDryer Wall Mount / Rolling 12 Port dryer includes hardware for both direct wall mounting, and a hand-truck wheel kit that allows you to easily roll the GearDryer around your shop. With 12 individual dryer ports, more than 200 CFM of forced airflow, and the option to dry with heated or ambient air, the GearDryer Wall Mount / Rolling 12 Port is the ultimate boot, shoe, glove, and gear drying solution. The most important factor in effectively removing the wet and sweat from the enclosed spaces in boots and gloves is a high volume of forced air. Delivering more than 200 CFM of airflow, GearDryer is one of the most powerful drying systems available. Other drying systems dry with only ambient air or only heated air. GearDryer is unique in that it gives you the option to choose. GearDryer uses a special self-regulating heat element that increases the air temperature approximately 25ºF above the ambient air temperature. This gentle heat increase is safe on gear yet effectively speeds up dry times. GearDryer is the ultimate boot, shoe, glove, and gear drying solution.